In the applet below, quadrilateral ABCD has been designed so that angle A and angle C always remain congruent. (In fact, you can adjust the measures of these angles using the slider in the top left corner.) Directions: 1) Move any of the BIG POINTS around so that angle B and angle D become congruent. 2) If this is the case, what special kind of quadrilateral do you have? 3) Use the tools of GeoGebra to prove your response to (2) is true. 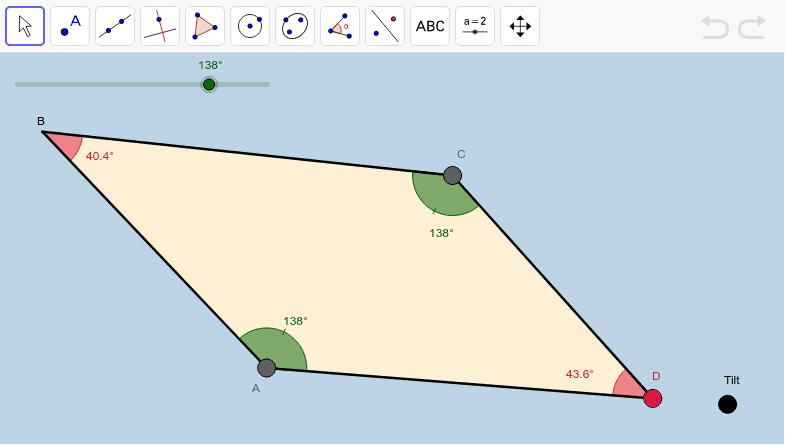 4) Again, use the tools of GeoGebra to prove your response to (2) is true. This time, use a manner different from the one you used in (3) above.